I know that it is a week early, but my birthday present arrived via FedEx and knowing what it was going to be, via Juan’s not so subtle hints, I couldn’t stand it being in the house and not being played with (even an ipod has a dream!). Of course, I was not expecting the Cadillac of ipods, he had called up the mantra of my good friend Becca “30 gigs for 30 years” which I would have been thrilled to receive. However, opening the card and seeing the inscription: I love you so much. You deserve the best I can affrod, an 80 gig iPod. Happy 30th birthday: I swear I thought I was a 5 year old at Christmas. Needless to say I have done nothing but play with it since. 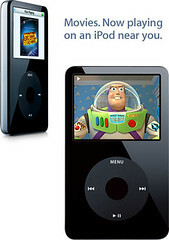 So, I post this image, courtesy of Apple, so everyone can know I have now entered the Pod generation of technology. « First Book Club Meeting….SUCCESS!